383 Madison Avenue is an office building in New York City located on Madison Avenue between 46th and 47th Streets and owned by JP Morgan Chase. 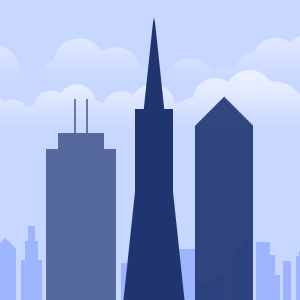 Designed by David Childs of Skidmore, Owings & Merrill LLP, it is 755 ft (230 m) tall with 47 floors. It was completed in 2001 and opened in 2002, at which time it was, by some reports, the 88th tallest building in the world. The building is approximately 110 000 rentable square meters (1,200,000 sq ft). The MGM Tower or Constellation Place is a 491ft (150m) tall skyscraper in Century City, California. 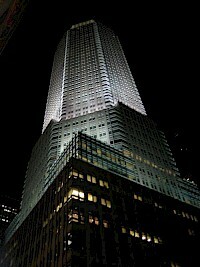 It was constructed from 2001 to 2003 and has 35 floors. It is 24th tallest building in Los Angeles, and the 5th tallest in Century City. 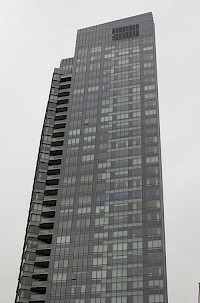 It was the first high rise to be completed in the 21st century in Los Angeles. The building was designed by Johnson Fain Partners, and has 700,000 sq ft (65,000 m) of Class A office space. MGM currently lease two thirds of the building. The Four Seasons Hotel in San Francisco, California, near the Moscone Center, is a hotel tower located on Market Street. The hotel houses a 277 guest room four-star hotel (Four Seasons Hotel), 142 condos, and retail stores. Non-linear viscous dampers located at the top of the hotel tower help dampen some of the wind sway due to powerful winds off the Pacific Ocean since the hotel stands 398 feet (121 m) tall. Marriott Indianapolis is a high-rise hotel in Indianapolis, Indiana. 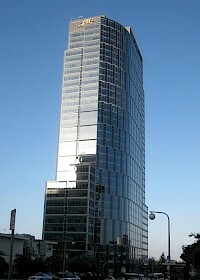 It was completed in 2001 and has 19 floors. It is the largest hotel in Indiana. The Indianapolis Marriott Downtown features 622 guest rooms and 40,000 square feet of meeting/event space spread over 33 rooms. Located inside the Indianapolis Marriott Downtown are the Champions Sports Bar and the Circle City Bar and Grille. Millennium Place is a building complex located in the Downtown Crossing district of Boston, Massachusetts. 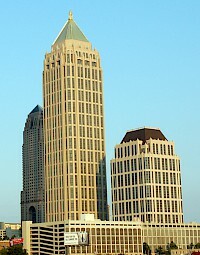 The complex consists of Millennium Place Tower I and Millennium Place Tower II. The taller building of the two, Millennium Place Tower I, stands at 475 feet (145 meters) with 38 floors. It is currently the 21st-tallest building in Boston. 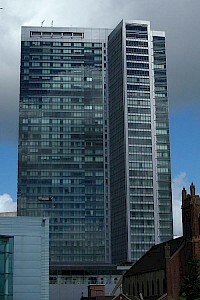 The shorter building, Millennium Place Tower II, stands at 446 feet (136 meters) with 36 floors. It is currently the 24th-tallest building in the city.